According to the Australian Heart Foundation, 55,000 Australians suffer a heart attack each year. While this event is never planned, cardiologist Dr Warrick Bishop looks at how we could be more aware of our risk. 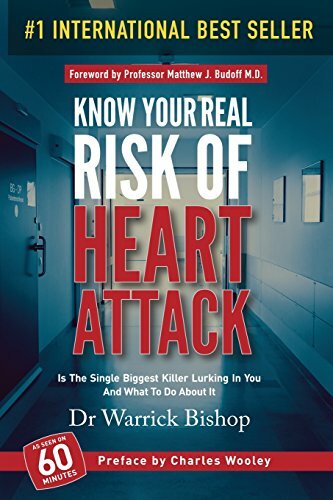 Why not read this short extract from his book – Have You Planned Your Heart Attack? My objective in this book is to explore how to avoid the first event. When coronary artery disease is diagnosed at the time of the event, the time the patient has chest pain or shortness of breath or a major adverse coronary event, the patient has already developed a ‘disease’. For me, to prevent chest pain or heart attack in the first place, to prevent the development of ‘disease’, is the Holy Grail of preventative cardiology. Current primary prevention practice is based on risk assessments. I believe this has scope for re-evaluation. The way we evaluate and calculate risk in individuals is based on observational data. This means that, over the years, databases have been compiled of features and factors found in individuals who have had coronary artery disease. The occurrence of those features and factors then lends weight to their being used as predictors for people before they have an event. Read the full article Full CT coronary angiography outlines the coronary artery in exquisite detail, giving information about the location of plaque, the quality and nature of plaque, threatened stenosis and size of vessel affected. This information has previously been unobtainable in a living patient.